Mu Voice is the award winning plug-in by Mu Technologies that allows you to tune your vocal recordings, apply special effects and add natural sounding harmonies when mixing your track. The proprietary spectral analysis and synthesis techniques set new standards in vocal processing providing a unique tool for your recording studio. Tedious pitch curve editing is history now. An internal delay of only 5.8 ms makes Mu Voice the ideal vocal processor to perform live on stage. Check out our YouTube Channel for video tutorials. "More Control - More Fun"
and it features innovative and creative ways to control the plug-in from any MIDI controller. MIDI-2-Pitch: The pitch of the lead voice can be tuned to a MIDI note (red keys). The tuning also affects also the harmonies. MIDI-2-Harmony: Several harmony channels can be put to MIDI mode. This means that when a note is played (orange keys), it is assigned to one of the MIDI mode channels. 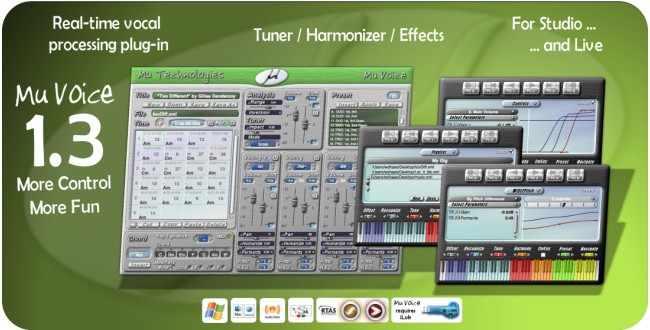 This features allows you to create harmonies just by routing MIDI notes to the plug-in. (Delta)Pitch-2-Parameter: This is an advanced feature that allows parameters to follow the pitch or the interval between the lead and the harmony. This feature is important for getting a natural sound. Control Change Events: Any MIDI controller can be mapped to any set of Mu Voice parameters. This requires a very simple set of actions; touching a controller, selecting a number of parameters, and editing the parameter curves. Program Change Events: These events are typically sent when a synth bank is changed or when a foot switch is pressed. Triggering a program change 10, will apply the chord and preset at the tenth position in the chord scheme. Playlists: Mu Voice XML files for different songs can be grouped in playlists. Files are added just by dropping them on the playlist. MIDI Assignable Navigation Controls: The MIDI panel has six programmable buttons. The first two are used to move forward and backward through the chord scheme. The second two are used to do the same but by using anchor points. The final two are to go to the next song in he playlist. Windows and Mac Installers make sure that all components are in the right place. Host integration is improved significantly. The XML project files are now linked to your recording session. Loading and saving your project will automatically load and save your Mu Voice XML file. Mu is currently developing a small VST host so that in the next release Mu Voce can run as a Standalone Aplication. Mu is working on a number of high performance software libraries. These libraries will be made available to third parties under a licensing agreement. Libraries will include FFTs, convolutions and band diagonal solvers. 1st Floor, South Bungalow, Vaikunth Society, Sir Lallubhai Park Road, Andheri West, Mumbai 400 058. Intelligent Harmonizing: An "intelligent" harmonizer takes into account the musical context of a piece like chord and scale information. This is exactly what Mu Voice does. A four track mixer allows to configure the voicing (1st, 2nd, 3rd or 4th voice) and octave for each channel. Scale / Chord Selection: The chord panel offers a straight-forward interface to select chords. When a given key signature is selected, the diatonic series of chords is displayed. By clicking the chords and modifiers, a chord is selected for harmonization. Chord Scheme Editing: Chords can be added to a scheme by pressing the "Insert" button or double clicking them. By clicking an item in the scheme one can navigate through a chord scheme. Mixer: The mixer combines all four track and allows to mute certain channels with the [M]-button. The first channel can be put in bypass ([B]-button). A pitch shift slider adds an extra interval to the channel. The range of the shift slider is expressed in half tones can be quantized by pressing the [Q]-button. Pan: To abtain a realistic spatial positioning, the panner uses interaural delays and an interaural gains that are based on psychoacoutic measurements. The panning parameter corresponds with the angle relative to the listeners nose. Humanizing: When the pitches of the harmonies are coupled too tight, they might interfere and be perceived as a single distorted voice. The "humanization" parameter solves this problem by adding very slight random pitch variations and an additional delay. Formants: The formants determine the "timbre" or "color" of the voice. When the pitch of the Voice is altered, the formants are maintained. One can disable the formant correction by pressing the green button next to the slider. The formant slider controls a linear scaling of the formants and alters the colour of the voice. By shifting the pitch up and scaling the formants, the voice of a women can be changed to the voice of a young girl. Harmonic EQ-ing: The proprietary spectral analysis technique on which Mu Voice is based, allow to control the amplitude of each harmonic in the sound. We named this effect harmonic EQ-ing. A number of presets are provided that illustrate this unique feature. Preset Management: To keep the large number of control parameters manageable, all parameters that are not related to the chord scheme can be saved in presets. By selecting a preset, configuring the parameters and pressing the 'Save'-button, the preset is stored. When a preset is selected and the 'Apply'-button is pressed, the preset is loaded. Presets can also be added to the chord scheme by pressing the 'Insert'-button. Write Mode: The plug-in is put in read-mode by pressing the [W]-button above the chord scheme. When you select a starting point and press the right arrow on your keyboard, you will move to the next position is the scheme while the timing of this event is recorded. Read Mode: The plug-in is put in read-mode by pressing the [R]-button above the chord scheme. The plug-in will synchronize itself to the host time so that it becomes fully automated. A state-of-art chord recogntion system to control the scale and chord over time. Do not worry about the fact that your keyboard has only 48 keys, the plug-in can be configured for any keyboard. XML based file exchange: The plug-in state, chord scheme and presets can all be saved in XML. This makes the configuration of your plug-in readable, editable and portable over all platforms. SIMD Optimizations: Mu Voice is highly optimized exploiting special processor instruction sets like SSE for Intel processors and Altivec for PowerPC's. Mu Voice uses two data files, W.dat and Y.dat. When it can't find them is generates them automatically. Therefore, when you launch the plug-in for the first time it will take a while to appear. From there on it will launch smoothly. Mu Voice works strictly for monophonic audio material.